Every once in awhile you discover a long lost treasure. 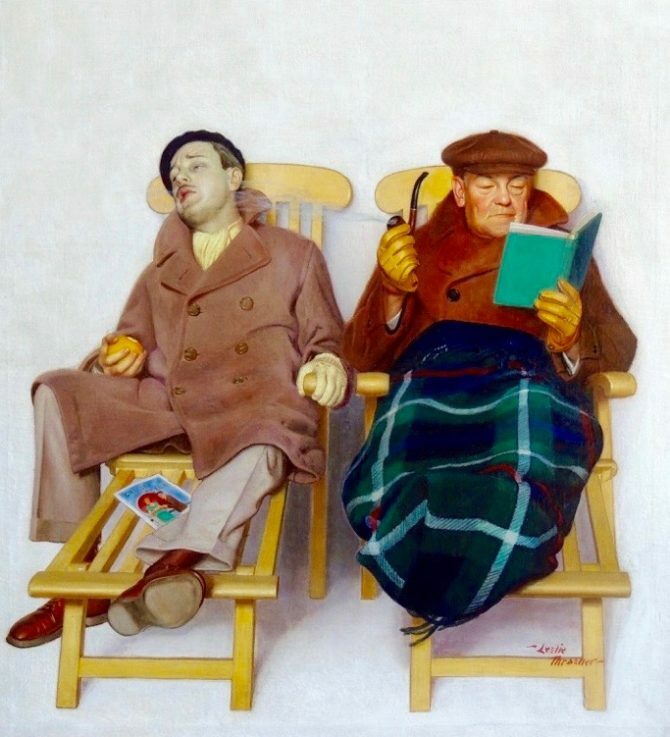 That is what happened to us a few months ago when we found this Charles Leslie Thrasher Saturday Cover painting for The Saturday Evening Post. Mr. Thrasher made a living painting impressive works for Liberty Magazine Co. in the 1920s- 30s. During these times and even prior to them, he illustrated for many America’s businesses. Some of his greatest works graced the Covers of the Saturday Evening Post. He created twelve covers in the teens, 6 in the twenties, and his two best in 1936 and 1937. This glimpse into his background brings us back to our discovery. We’re very proud to add to our collection the last painting that Mr. Thrasher created for The Saturday Evening Post that earned its place on the January 16, 1937 cover. Its three times the size of the average painting of his Liberty Covers, and is an impressive 36” x 31” oil on canvas, signed lower right. This piece has been beautifully restored and rests in a museum quality frame. In addition to being remarkably rendered, it is warm hearted and humorous. The two gentleman, who probably don’t know each other, are practically sharing each other’s armrest, and one of them is not very happy. Obviously seasick, judging by his somewhat green complexion, he is holding onto his deck chair with his gloved left hand. His partially peeled orange is tightly ensconced in his bare right hand, and he is sweating profusely. He has given up on the cruise brochure, and it appears his deck mate’s pipe smoke is not adding to his comfort. We hope you find this engagingly brilliant piece of art as delightful as we do.